The gorgeous Borneo sunshine hit me as I landed in the “city of cats” the day before the big event. Kuching is a great city in itself. Poised around a huge riverfront, it’s a laid back city with great charm and character. The people are friendly, the architecture great and it feels a million miles away from the mainland. Borneo brings this whole new twist to things which is hard to describe unless you’ve been there. Plus, on top of that, it’s cheap. Food, whilst less varied here, is just as cheap as Penang. The seafood noodle soup, Kuching Laksa, is well worth a try and I found it a million times nicer than its mainland equivalent. Kolo Mee is another popular dish and, whilst nice, is pretty much just pork with noodles. It made for a good comfort eat after the festival though. Street food is in abundance in the city, especially in the street I was staying on (Jalan Padungan) where a stall or small restaurant popped up every two or three buildings down. Another mouth-watering food in Kuching is the layer cake, which comes in a range of weird and wonderful colours and flavours. A number of stalls pop up on the Main Bazaar opposite the river in the evening, selling everything from Oreo cake to Jasmine cake. They’re happy to give out free samples and a whopping cake costs just 10RM. Had I not discovered it on my last day, I’d have put on a lot of weight. Drinking is also much cheaper in Kuching than on the peninsular. You know you’re onto a winner when drinks in the bar are cheaper than 7-11! You can drink a can of beer in a nice bar (usually with live music on in the background) for 6RM a pop, or visit one of the local food vendors to get Tsingtao (Hong Kong flashbacks) for 3.50RM or Tiger for 4.50RM. For some reason, the shops/supermarkets are more expensive. I didn’t do a great deal in Kuching before and after the festival, but did hang around for a couple of days to do some sightseeing. The city itself is worth a walk around, though I felt its Chinatown and Little India left a lot to be desired. I didn’t see anything remotely Indian about Little India. It’s worth getting a boat across the river (50 Sen one way, 1RM for the journey back) though you can’t get much closer to the gloriously golden state building. As it’s Malaysia, there are plenty of shopping malls, nice parks and I was also lucky enough to be there during the food festival which allowed me to stuff my face and be cultured at the same time. 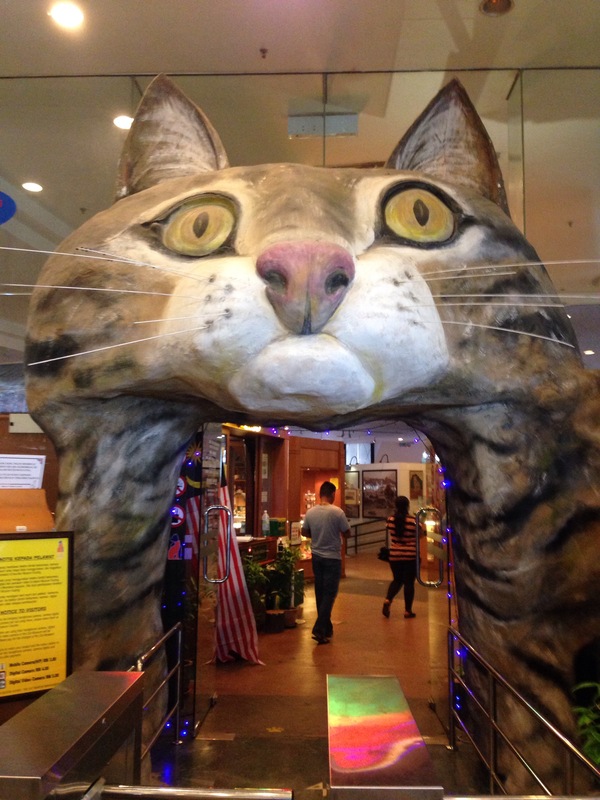 My roommate in my hostel suggested we check out Kuching’s cat museum, the first in the world. I’ve never been a cat fan but was eager to cross this off the bucket list, particularly because Kuching is very proud of its fabricated cat heritage, evidenced by the cat statues on every road. The museum is so far out of town it’s almost as if they’re embarrassed by it. You can catch infrequent buses to it but we hopped on a boat, crossing the river near ASTANA, then walked about 45 minutes to reach it. Clearly this wasn’t the usual method, since the kids in the streets we walked down appeared shocked to see Westerners. After getting lost and getting a lift with a kind stranger for the last leg, we found ourselves at a giant government building. It’s all very bizarre – the official building is tainted by the gigantic cat head in the corner. The museum is free to enter, though you have to pay 3RM if you have a burning desire to take pictures of cat statues. The museum is basically like stepping into an old lady’s house, with hundreds of porcelain cat statues, plates, dressed up cats and posters. Any piece of merchandise, food, film or picture that has ever had a cat involved is in this museum. You remember cats you never even knew existed. As much as I like a feline trip down memory lane, the museum didn’t change my life in the way I thought it might. Still it was good fun, and I can tick “world’s first cat museum” off the bucket list. 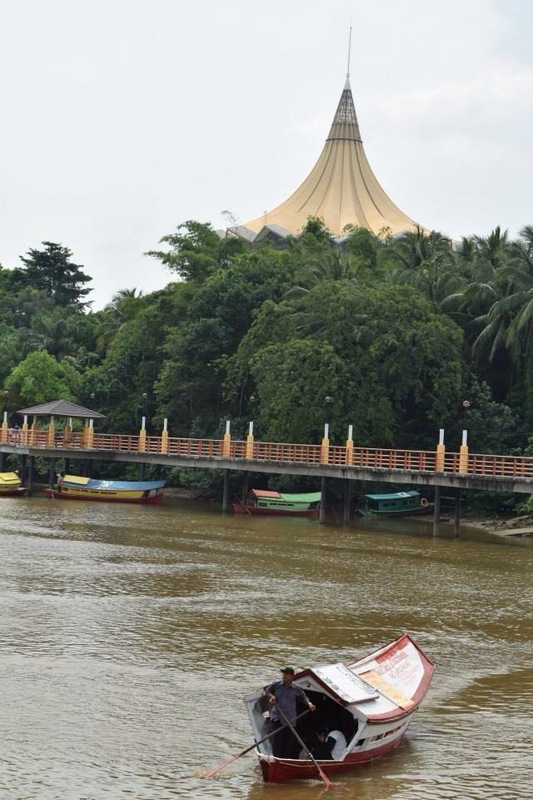 Perhaps more iconic in Sarawak is visiting Semenggoh, the orangutan sanctuary about an hour away from Kuching. The orangutans are seen at their feeding times which take place at 9am and 3pm each day. A public bus, K6, goes there from Jalan Masjid near the open air market, but you need to get the 7.15am bus if you’re going to make the morning feeding. The bus cost 4RM and we arrived about 45 minutes before the feeding, which is about a 20 minute walk up an easy hill. It’s 10RM entry for non-Malaysians. There’s not much else there (unless you want to hike some of the trails) so we amused ourselves with orangutan birth certificates until the stars arrived. A few came out early in the main waiting area, amusing the crowds and acting as perfect selfie material for tourists as they were so close. When we went to the feeding area, it took ages for any appear, as it apparently depends on whether they can be arsed to get out of bed that morning. We did see some cool snakes and millions of ants marching together though. Eventually, an orangutan arrived and the humans jumped over one another to get the ultimate orangutan photo. They’re fantastic animals though. I noticed in Singapore how scarily human they are and this was only reinforced here. 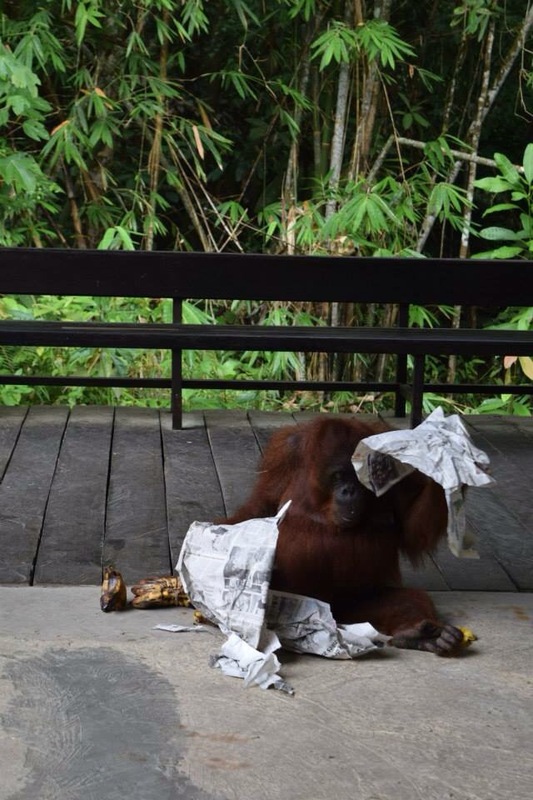 It’s weird when you can relate to an orangutan. And with that, my brief Borneo adventure was done. Most people usually jump straight across to Sabah and Kota Kinabalu in Borneo but, even without the festival, I think Kuching has got so much to offer and I could have spent another week in Sarawak alone.